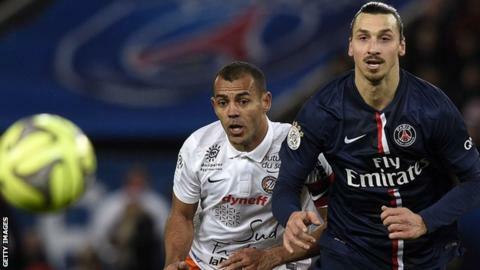 Paris St-Germain missed the chance to go top of Ligue 1 after being held to a goalless draw by Montpellier. Laurent Blanc's side moved level on points with leaders Marseille, who lead their rivals on goal difference and play Lille on Sunday. PSG lacked inspiration and creativity against a Montpellier side who did not manage a single shot in the first half. The closest PSG came to a goal was a Thiago Silva header being cleared off the goalline by Anthony Mounier. Match ends, Paris Saint Germain 0, Montpellier 0. Second Half ends, Paris Saint Germain 0, Montpellier 0. Corner, Paris Saint Germain. Conceded by Jonathan Ligali. Mathieu Deplagne (Montpellier) wins a free kick in the defensive half. Jonathan Ligali (Montpellier) is shown the yellow card. Offside, Montpellier. Mathieu Deplagne tries a through ball, but Kévin Berigaud is caught offside. Substitution, Montpellier. Souleymane Camara replaces Jonas Martin. Attempt missed. Thiago Silva (Paris Saint Germain) header from the centre of the box is too high. Assisted by Jean-Christophe Bahebeck with a cross following a corner. Corner, Paris Saint Germain. Conceded by Mathieu Deplagne. Lucas Digne (Paris Saint Germain) wins a free kick in the defensive half. Foul by Kévin Berigaud (Montpellier). Jonas Martin (Montpellier) is shown the yellow card for a bad foul. Substitution, Paris Saint Germain. Lucas Digne replaces Maxwell. Jonas Martin (Montpellier) wins a free kick in the defensive half. Substitution, Montpellier. Kévin Berigaud replaces Lucas Barrios. Attempt saved. Jean-Christophe Bahebeck (Paris Saint Germain) header from the centre of the box is saved in the bottom left corner. Assisted by Gregory Van der Wiel with a cross. Attempt blocked. Hilton (Montpellier) right footed shot from the right side of the box is blocked. Foul by Maxwell (Paris Saint Germain). Morgan Sanson (Montpellier) wins a free kick in the attacking half. Substitution, Montpellier. Mathieu Deplagne replaces Bryan Dabo. Offside, Montpellier. Jonathan Ligali tries a through ball, but Lucas Barrios is caught offside. Anthony Mounier (Montpellier) wins a free kick in the defensive half. Attempt missed. Jean-Christophe Bahebeck (Paris Saint Germain) right footed shot from outside the box is close, but misses to the left. Substitution, Paris Saint Germain. Jean-Christophe Bahebeck replaces Edinson Cavani. Substitution, Paris Saint Germain. Adrien Rabiot replaces Blaise Matuidi. Attempt blocked. Thiago Silva (Paris Saint Germain) header from the right side of the six yard box is blocked. Assisted by Thiago Motta with a cross. Corner, Paris Saint Germain. Conceded by Abdelhamid El Kaoutari. Attempt blocked. Zlatan Ibrahimovic (Paris Saint Germain) right footed shot from outside the box is blocked. Assisted by Thiago Motta.